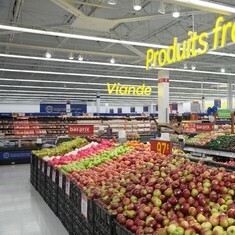 The new Supercentre in Longueuil opened its doors on September 28th. This prototype store is the 5th in Canada and offers multiple innovations providing a renewed shopping experience focused on customer convenience. The store also launched the new “Scan & Go” technology, the first of its kind in Quebec. 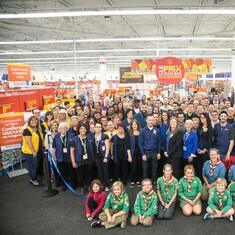 Montreal, QC – September 28, 2017 – This morning, Walmart Canada unveiled its brand new Montérégie Supercentre, located at 1999, boulevard Roland-Therrien, in Longueuil. The event also served as the official launch for the first prototype store in Quebec featuring many innovations including Scan & Go, as well as, the new grocery pickup service. “We are pleased to offer our Montérégie customers a new Supercentre, which will allow them to enjoy an enhanced, more convenient and faster shopping experience. This type of store clearly shows how we listen to our customers and want to continuously improve and expand our offering in order to keep being at the forefront of a changing retail landscape”, stated Cyrille Ballereau, Vice-President of Operations for Eastern Canada. The Longueuil prototype will be the first store in Quebec to use the Scan & Go technology. This service will allow customers to pick up a portable barcode scanner as soon as they enter the store. Customers can then start shopping while scanning the items they wish to purchase as they go along. Their itemized receipt will instantly be displayed on the portable scanner, allowing them to keep track of their budget. Once at the checkout, all the customers need to do is proceed with the payment. Furthermore, this Supercentre will now offer the new grocery pickup service. Beginning today, customers can order their groceries online and pick up their purchase at the store at their desired timeslot. The groceries will be packed in advance by a specially trained associate who will select the best products. Another associate will then place the groceries in the customer’s car as soon as he arrives at the store. In keeping with Walmart’s goal to meet and exceed the expectations of their customers and to listen to their needs, several innovations were implemented at the store. Product display and floor plans were redesigned and upgraded. The store’s design has also been renewed, thanks to a new modern color palette and revised signage. Checkouts have three-way conveyor belts making it easier to fill reusable shopping bags. The new store provides a wide range of products, including electronics, decorative items, groceries and clothing, in order to shop everyday low price merchandise under one roof. Moreover, as a Supercentre, the store offers a full range of imported premium quality fruits and vegetables, in addition to fruits and vegetables from Quebec, as well as, a large selection of organic products. Among the fresh meats available, we find 100% Canadian Angus beef, Maple Leaf chicken, pork and sausages and Canadian salmon. Proud partner of Aliments du Québec since 2011, Walmart wants to encourage regional producers and suppliers and strives daily to offer its customers fresh local produce at the lowest price. “Helping our customers save money every week is a priority for Walmart. We are happy to be able to provide a full range of quality products and fresh foods, making it possible for our customers to buy their every essentials and their groceries at low prices and in one place”, stated Store Manager, Valérie Clermont. Celebrations for the opening will continue on Saturday September 30th, when the store will host a big party from 11 am to 3 pm. During this event, kids can get their faces painted and customers can enjoy musical performances and refreshments, as well as, receive free samples. Walmart Canada operates a growing chain of 410 stores nationwide serving more than 1.2 million customers each day. Walmart Canada's flagship online store, www.walmart.ca, is visited by 600,000 customers daily. With more than 90,000 associates, Walmart Canada is one of Canada's largest employers and is ranked one of the country's top 10 most influential brands. Walmart Canada's extensive philanthropy program is focused on supporting Canadian families in need, and since 1994 Walmart has raised and donated more than $275 million to Canadian charities. Additional information can be found at walmartcanada.ca, facebook.com/walmartcanada and at twitter.com/walmartcanada.